Three men, including a woman, were killed and seven injured in a road accident on the Neelon-Chamkur Sahib road near Pawat village in the wee hours of today. The victims belonged to Bhinder Khurd village and were going to Kiratpur Sahib to immerse the ashes of their grandfather. The victims were travelling in a Tata Sumo when suddenly a loaded truck coming from the opposite side collided head-on with their vehicle. The accident was so fierce that three persons were killed on the spot. The deceased have been identified as Nasib Kaur (65) of Bhinder Khurd, Jasvir Singh (45) of Kotla Miharwan and Piara Singh (45) of Buttar village. All the victims were related to one another. The injured have been identified as Baldev Singh, Balwant Singh of Bhinder Khurd, Jaswant Singh and Jaswinder Kaur of Buttar, Pawanjit Kaur of Harika and a child, Ahwanjit Singh. The injured have been rushed to the Civil Hospital at Samrala, from where the five critically injured ones have been referred to Ludhiana. The bodies of the deceased have been handed over to their families after a postmortem. SHO of Machhiwara Amardeep Singh said a case had been registered against the truck driver who was on the run. Heart-rending scenes were witnessed when the family members of the deceased reached the hospital. 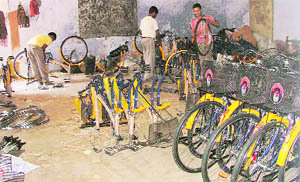 Even while the Punjab government has introduced the Mai Bhago Cycle Scheme to promote girl child education in Punjab, yet ironically students of Saheed Sukhdev Thapar Government Senior Secondary School for Girls, Bharat Nagar, are forced to remain out of their classrooms as these rooms are in use to assemble bicycles. The authorities have occupied two classrooms for assembling of cycles to be distributed in district’s schools, while two senior secondary classes were being held on the ground since October 22. The school is already facing shortage of classrooms as a part of the building has been allotted to various centres and seminars conducted by the education department. Girl students of classes XI (commerce) and XII (arts) are sitting in open on the cardboard sheets and polythene bags. Even they struggle daily to arrange cardboards and polythene bags to sit. A girl student of Class XI said, “We requested the principal but she did not do anything. Now the weather has changed and we feel cold in open air.” Some girl students are suffering from fever because of bad sitting arrangements. “These all are government’s decision, what can I do when the orders are issued from Chandigarh. It leads to loss of study and inconvenience to students but nothing is in my hands. The government should think about it,” said principal Kamljit Kaur. Obesity, earwax, sinus and nasal blockage was the primary cause behind the rejection of candidates during an Army recruitment rally at Dholewal Military Complex here today. Col MS Mahar, Director of Army Recruitment, and medical screening officer AS Thakur, said nearly 70 per cent of candidates failed the trial due to these reasons. They observed that candidates hailing from urban areas were overweight compared to their counterparts from rural areas. Overweight candidates were seen slipping and falling while candidates from rural areas faced no problem in clearing the physical fitness test. But these youths were rejected due to earwax. “Like most years, this time too we faced the same problems. We have put up clear guidelines suggesting that the candidates should visit an ENT specialist before appearing for the trial, but the candidates do not follow the guidelines, which results in their disqualification,” said Thakur. According to doctors, out of 1,000 candidates, nearly 400 candidates faced disqualification due to earwax. Col Mahar said: “We face a lot of problem due to earwax. A physician conducting a candidate’s initial medical examination can disqualify a candidate if the latter’s ears are blocked due to wax as the physician will not be able to know if the aspirant is hearing impaired. Another common cause of candidates being rejected is nasal blockage. Col Mahar said: “Though some candidates complete the 1,600 metre race in record time, their medical checkup reveals that their nostrils are blocked. Such candidate are considered permanently unfit. Tax evaders continue to thrive at the railway station as the authorities concerned have failed to crack the whip on them. While the excise and taxation department says it cannot happen without the connivance of railway officials, the latter maintain that the the department was “weak” and even after nabbing some culprits here today, it could not get them booked. While patrolling, officials of the taxation department noticed four horse-carts carrying about two dozen cartons coming out from the station. Officials chased them and the carts were taken back to the station. Navdeep Singh Hadiwal, excise inspector, said they nabbed the suspects, but the gate near the compound was locked by the railway authorities. “I have clicked a photograph of the locked gate, which otherwise remains open. Within seconds, the suspects merged with the crowd at the platform and it became difficult for us to recognise them. We were only two while they were around 10. When they disappeared, the railway authorities opened the gate from where the parcels are released. The gate was closed for only one or two minutes and as soon as the suspects disappeared, the gate was reopened. Such an act is not possible without the connivance of some railway officials,” he alleged. However, Superintendent Railways RK Sharma claimed that the department officials were telling lies. “Since they had failed to book the culprits, they are blaming the railway authorities. The officials or the police represent the law, which is supreme. They could have caught them, but they did not for reasons best known to them. It is unfortunate that they were incompetent, but were blaming the railway authorities for the lapse. These are lame excuses. They are part of the nexus,” he alleged. Jasmeet (name changed), a three-and-a-half year old girl has to be given four shots of Insulin daily to be alive! Accompanied with her two maternal aunts, Jasmeet is a regular patient at a leading hospital in Model Town area. Though her parents have settled abroad, due to the severe disease - Type I diabetes, she has been staying here with her aunts, as the medical treatment in India is cheaper than that in the Western countries. Jasmeet’s doctor, Dr Geeti Puri Arora said she felt, too, bad to see a lot many children suffering from Type I diabetes these days. Type I diabetes is the condition, which is Insulin dependent. Juveniles suffering from Type I diabetes are to be given life-long dose of Insulin (injection), varying from one shot to even five shots a day. “It is unfortunate that even small children suffer from diabetes. We have juveniles from six months to 18 years of age, who suffer from this disease. Though the incidence of Type I disease among children is low i.e. 0.5-2 per cent but it is scary. There are several reasons for Type I diabetes among kids, which include genetic factors, obesity among kids, lack of physical activity and rising levels of stress. At this stage, awareness is the only viable solution to the existing problem,” said Dr Arora. Dr Arora along with other residents in the city have started running the Juvenile Diabetes Club, which has about 52 patients (all children). The club members boost the morale of the patients and their parents, organise competitions to generate awareness about the disease and organise camps to shun myths about the disease. If Insulin is properly given to a child then there was no threat to his/her life, but in case a child suffered from Diabetes Keto Acidosis, then the child could slip into coma, too. Already under fire for delay in various development works and embezzlement of funds to the tune of many lakhs meant for various development works in the town, Jagraon Municipal Council president Baldev Krishan Dhir found himself in a bizarre situation when some municipal councillors openly levelled allegations of corruption against him during the monthly general house meeting of the local Municipal Council today. Soon after executive official Pardeep Kumar announced the meeting open and started proceedings, municipal councillors, Ravinder Sabharwal and Kulwinder Singh Kala, raised the issue of misuse of funds meant for the development works in the town and use of substandard material by the contractors who have been awarded various development works. Alleging that contractors have used substandard material while carrying out development works in their areas, both councillors demanded the president to launch an investigation against such contractors and blacklist them. Following this, it was the turn of independent councillor Jatinderpal Rana who alleged that despite repeated warnings, the contractor who has been awarded the work of fixing interlocking tiles in his area has been using substandard material. Citing examples of different localities where the interlocking tiles fixed only two months back have started dislocating, he demanded an inquiry by the higher authorities. Rachpal Singh, who was considered close to the MC president till some time back, raised the issue of stolen iron manhole covers from his ward. He alleged that the iron manholes were allegedly sold by the contractors, who had been awarded the work of fixing interlocking tiles. “I had also raised the issue in the last two meetings of the MC and at that time I was assured that an inquiry would be conducted and a report will be submitted within one week but more than two months have passed till then and no inquiry has been conducted so far,” rued Rachpal. Alleging MC president Baldev Krishan Dhir being hand in glove with the contractor, he further said the MC had not started the inquiry against the contractor so far as he had misused the funds in connivance with the president. However, there was one good thing during the meeting when EO proposed an increase in the funds meant for the municipal councillors. But four municipal councillors, including Kulwinder Kala, Jatinderpal Rana, Rachpal Singh and Ravinder Sabharwal, objected to this and said in stead of raising the funds of the municipal councillors, the council should increase salaries of safai karamcharies who have been on strike for increase in their salaries. While some of the municipal councillors appreciated this step, there were few others who objected to this saying that this will put extra burden on the municipal councillors and will increase corruption. The meeting concluded with the EO accepting the demands of various municipal councillors and assured them of preparing a report and submit it with the higher authorities of the local bodies to get it approved. He also assured the house of marking an inquiry against the contractors against whom the municipal councillors have levelled allegations of using substandard material. MC president Baldev Krishan Dhir, while denying the allegations, also gave his approval to start an inquiry against the contractors involved in use of substandard material. A team led by District Session’s Judge SP Bangar visited the Observation Home at Shimlapuri and celebrated Children’s Day here today. Bangar, who is also chairman of the Legal Services Authority, interacted with the children at the home and preached them to shun the criminal path and become a good human being. He spoke at length about the rights of children and free legal facility offered by the government. He distributed fruits amongst the children. Later during the day, he visited Borstal jail and women jail. While addressing the inmates, he criticised the malpractice of female foeticide. He said it was a serious offence and residents should help the authorities in exposing the culprits behind such heinous acts so that strong action could be taken against such persons. He added that active participation of people would help the authorities in nipping the menace in the bud. On the occasion of World Diabetes Day, the department of medicine at CMCH organised a free medical camp where around 300 patients were examined and given free blood sugar test to assess the risk of developing the disease here today. Patients were also offered free counselling by specialists of diabetes and endocrinology department. A presentation on diabetes education and self-care was screened. A quiz competition for children with type 1 diabetes was also organised. A diet display was also organised by the department. Patients also underwent free body mass and fat analysis test, blood sugar, diabetic foot. Giving information regarding the camp, Dr Marry John, head of the department of medicine, said the World Diabetes Day raised global awareness on diabetes, it’s escalating rates around the world and how to prevent the illness in most cases. Started by the International Diabetes Federation (IDF) and WHO, the day is celebrated today to mark the birth anniversary of Frederick Banting who, along with Charles Best, was instrumental in the discovery of Insulin in 1922, a life-saving treatment for diabetes patients. The Army’s unique identity (UID) system is turning a hit. After being introduced in July last year, the biometric screening has become a regular feature of the Army recruitment trial. Though the Army may have not nabbed any spies who were trying to enter the forces as soldiers, they have certainly nabbed imposters appearing for the written examination of the candidates who have cleared the physical test. While quoting one such incident, a member of the recruiting unit said recently the Army recruitment cell went into a tizzy when the fingerprint of a candidate did not match in the biometric system. “The passport size photograph available in the record suggested that the candidate was same who appeared for the physical trial. We decided to visit the house of the candidate. On reaching the house, we came to know the youth who appeared for the written examination was the twin brother of the candidate who appeared for the physical examination,” said the recruitment official. The software development company, Ekklavya’s Biometric Recruitment and Executive Solution, which was working in coordination with the Army of over two years, has developed the system for the Army. The Army has installed the biometric system to keep a track of the candidates selected during the physical test. According to director recruiting Col MS Mahar, the thumb impression of the candidates was lifted on the biometric machine once the candidate clears the physical fitness test. Following the selection, the Army recruitment department collects every bit of detail pertaining to the candidate, he added. “Starting from date and place of birth, the recruitment agency would gather information about the educational qualification, family background and crime record, if any, in the profile of the selected candidate. All information would filter out on the computer screen. The Army would keep the information till the soldier serves the Army,” said Col Mahar. The Army has emulated the procedure from the British and American Armies who keep a biometric track record of their soldiers. It is learnt that several cases have been reported in the past where the candidates participated in the recruitment drive by forging their educational certificates. The city is crying for the lungs to breathe. Residents, MC authorities, social organisations and environmentalists have been trying hard to save the environment from its further degradation. But there are persons, who, for their own vested interests, cut the green cover in public parks and the authorities look the other way. At a public park opposite the Mai Nand Kaur Gurudwara, Ghumar Mandi, the trees are not “allowed” to grow. Because when they grow, they block the view of the shops behind and clientele of the shops gets affected. The gardener is asked to cut its leaves, branches for getting a “clear” view of its shop, the shopkeeper pays to the former from his own pocket! Kishan, the gardener working in the park for the past several years, said he was being paid by the shopkeeper for the work. “The shopkeeper gets the trees cut whenever they start blocking the view of his shop. Five-six months back, I had cut a tree because the shopkeeper wanted. This time, too, he wants me to cut a tree, but an environmentalist visiting the gurudwara daily has asked me not to cut the tree. When I said no to the shopkeeper, he stopped giving me the salary,” said Kishan. Satbir Singh Wahi, who has been doing efforts to save the environment, said he felt bad to see the trees being cut inside the public parks. “It is nobody’s property. We are trying hard to grow the green belt but people having vested interests have their own views. Why should an individual get a tree cut at a public place? The gardener should be paid by the MC, councillor or park management committees. Why should he get salary from an individual for working in a public park? The authorities must take stern action against the defaulters,” said Wahi. A 10-day national training programme on “Enhancing the input application efficiency by using precision farm machines, remote and ground sensors” commenced at PAU campus here today. The training has been organised by the department of farm machinery and power engineering (FMPE), Punjab Agricultural University (PAU), under the aegis of National Agricultural Innovation Project (NAIP), Indian Council of Agricultural Research (ICAR), New Delhi. The programme involves participation of 22 scientists and researchers from ICAR, State Agricultural Universities (SAUs) and Central Agricultural Universities (CAUs). Inaugurating the training programme, Dr Baldev Singh Dhillon, Vice-Chancellor, PAU, said in view of the increasing food demand and decreasing land availability, precision farming was vital. Stating that precision farming had got a great scope, he said the adoption of this technology could reduce the input cost, enhance profit and increase production in the present agricultural scenario. He added that the use of innovative techniques of precision farming to produce more food would be ecologically, economically and socially beneficial. Addressing the participants, PAU director of research, Dr SS Gosal, said the precision agriculture was essential to address food security and poverty alleviation in the country. Remarking that the demand for food will be 50 per cent higher by 2030 due to the rising population, Dr Gosal underlined the need for efficient management of the natural resources. He told PAU was conducting various research projects in the area of precision farming and informed that the leaf colour chart (LCC) and tensio meter developed by the university were useful precision tools for saving nitrogen and water for the crops. Nearly 4,000 youths from Moga thronged the city to participate in the Army recruitment rally. Though the turnout was encouraging, the recruiting agency was not happy with the physical standard of candidates and felt that the aspirants lacked a professional approach. “They are not up to the mark. They failed to clear the rounds. They should prepare well in advance for the recruitment,” said Col MS Mahar, director recruiting. He added that physical training was important before appearing for the physical fitness trial. Gurdeep Singh of Budh Singh Wala in Moga was the only saving grace. A national-level sprinter, Gurdeep, impressed everyone as he zipped past the bunch of 30 candidates during the 1,600m run. According to the authorities, Gurdeep Singh completed the race in record time and performed well in other physical fitness tests also. “We expect a good show in the days to come when the youths from Ludhiana will participate in the rally,” said Col MS Mahar. 100-page diary to record details of 220 days! The SSA (Sarv Shiksha Abhiyan), Punjab, has issued diaries to teachers for monitoring classwork, but pages in these diaries are not sufficient to maintain a record of the work. The system was introduced a few years ago to monitor teachers and record their daily output, including the details of classwork, homework and special activities. Government schoolteachers find it difficult to fill in all these details. Teachers claimed that the department demanded details of every subject and every period, but the diaries had no space for the same. These had small columns and were designed for recording details of less than 100 days, whereas working days of the department are 220. Ironically, dairies are issued only once in an academic year. “Though the government issued the diaries in September, towards the year-end we are left with no option, but to use notebooks for writing the details,” said a government schoolteacher. “ The government should increase the number of pages in these diaries or start issuing more diaries. We often demanded these revisions from the officials concerned, but it seems that they are not interested in knowing the ground realities,” lamented another teacher. “Diaries are issued by the state-level body of SSA, so we can't do anything about it. These are quite handy,” said, district coordinator SSA Anil Matharu. The presence of a large number of stray animals wandering in various parts of the city is posing a serious threat to commuters on various city roads, including the Ludhiana-Ferozepur highway. Last night, a youth hailing from Dashmesh Nagar rammed his bike into a truck when a buffalo suddenly came in front of him on the Tehsil road here. Sources said the youth sustained serious injuries and was admitted to Dayanand Medical College and Hospital (DMCH), Ludhiana. Residents have been complaining about the menace for long, but the officials concerned failed to take any action. The sources added that the major reason behind the increase in the number of the stray animals was “Pashu Mandi” (animal fair), which was organised every month in Jagraon, as many people, who came to take part in the fair, left behind a large number of animals. One could see animals roaming freely in the town, said residents. They could be seen wandering on the Ludhiana-Ferozepur highway. The presence of stray animals on the road has led to a large number of fatal accidents in the past and many people have lost their lives in road accidents. But it seems that the administration has learnt no lessons from the past. The situation becomes even more dangerous at night as commuters often fail to spot the animals standing or moving in the middle of a road. Though there are two big “Gaushalas” in the city, still a large number of stray animals can be seen roaming on roads. Residents lamented that neither the municipal council nor the “Gaushala” seemed interested in checking the menace. Residents’ pleas have fallen on deaf ears as nothing concrete has been done so far. Traffic police in association with an NGO had tied reflectors on the necks of these animals so that drivers could spot the animals in the dark too. Though the idea of tying reflectors around the necks of animals proved successful and the number of accidents also decreased, with the passage of time the reflectors were either removed by miscreants or they broke down. When contacted, MC president Baldev Krishan Dhir, said the civic body was doing its best to sort out the problem. “We are in talks with Gaushala representatives to make arrangements for the stray animals,” he said. He added that the MC was looking for suitable land for constructing another “Gaushala”. When contacted, Shri Krishan Gaushala secretary Jagdish Ohri said, “We are not in a position to accommodate more animals in the “Gaushala”. The MC should construct another “Gaushala”, he added. The ancestral house of legendary freedom fighter Lala Lajpat Rai in Jagraon is in a state of neglect. The building has been crying for attention for long, but neither the state government nor the Union government seem to be interested in doing the needful. The leader’s ancestral house speaks volumes of the government’s apathy. The building can collapse anytime. The 83rd martyrdom day of Lala Lajpat Rai falls on November 17. During a visit to his house situated in Mohalla Misarpura of Jagraon today, it was found that the building was in a bad condition and could collapse anytime if not repaired at the earliest. “One can easily guess the ‘sincerity’ of the government towards preserving the freedom-fighters’ memorials after seeing the condition of Lala Lajpat’s house. On the one hand, the state government is spending crores of rupees on the Kabaddi World Cup, on the other hand, it has done nothing to save the building,” says Amarnath, a senior citizen, who resides near the house of Lala Lajpat Rai. The archaeological department had taken the custody of Lala Lajpat’s ancestral house in 1987 and had declared it a national heritage. A library and a museum were also constructed in memory of the freedom fighter a few years ago, but nothing concrete has been done so far to save the building from ruins. Heaps of garbage welcome visitors to the building. The library and the museum too are in a pitiable condition. Rusty doors and windows, broken furniture and worn-out books explain everything. 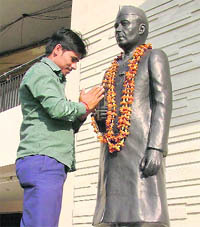 Though the local administration as well as a school and college named after Lala Lajpat Rai organise functions every year to remember the great freedom fighter and tall claims are made by leaders during these functions to provide funds for the repair and maintenance of the house but nothing has been done on the ground level to save the building. Sources said a Cabinet minister had arranged funds for the maintenance of the house a few years ago, but after seeing the condition of the house it seems that not even a single penny has been spent on its maintenance so far. Advocate Mohinder Singh Sidhwan of Virsa Sambhal Manch lamented that while the freedom fighters from Punjab played a significant role in the freedom of the country from British rule, the government has failed to preserve the memorials of these martyrs. The spate of rallies, or to be more precise, the yatras taken out by senior leaders of various political parties in the city during last few days, have created virtual hell on the city roads. Even as the police and authorities have been more than busy in chalking out route diversions and asking city residents to plan their movement accordingly, the residents were literally being held to ransom by getting stuck on the roads for hours together on Saturday and Sunday. If the traffic disruption created by the Punjab Bachao Yatra of Congress president Captain Amarinder Singh on Saturday was confined to approaches to the Grain Market on the Gill road, the one taken out by BJP leader LK Advani on Sunday turned out to be the mother of all nuisances. All major roads, including parts of the Ferozepur road - a national highway, parts of the old GT road, Jagraon bridge and Domoria bridge - both providing a link between the old city and new localities, having been closed for several hours during the day. Harassed and stranded people finding most of the roads closed to traffic were clueless as to how to reach their destinations. So much for the yatras purportedly being taken out for the betterment of the common man! The rath yatra taken by LK Advani here yesterday must have been organised to show the “strength” of the party to the masses, but for a common man it came as an unforgettable experience. A couple had to attend cremation of their distant relative at the Civil Lines but they were not allowed to move on the road. They were asked to adopt an alternate route but they were stuck in a traffic jam for more than an hour and they could not make it to the cremation ground. Besides, the rehri vendors “cursed” the government and organisers for they lost their business today. “If I am committed to any party, I will cast my vote to that party only, come what may. Such shows of strength hardly make any difference,” said a commuter stuck in the traffic jam. Children are happy on the occasion of Children’s Day. Children of the new generation have limited knowledge about why the day is celebrated except that it is “Chacha Nehru’s birthday”. Ask them who he was and many wouldn’t say much. If they know that he was the first Prime Minister of India, they won’t be knowing anything beyond that. It is ironical how little knowledge is being passed onto the younger generation about the leaders that built the nation. At the recently concluded fashion week in the city, it was all glamour and glitz. A lady turned up wearing a cheetah dress drawing glances. Audience started saying whether she had turned up for the fancy dress competition or the fashion show. They said animal prints were in vogue these days. As for the city residents, they got a taste of the other side of the glamour when bouncers accompanying the celebrities stopped them from getting, too, close to the celebrities. With the wedding season on, the city roads are set to be the worst affected. Many of the residents during festivals or functions dig tents in front of their houses. When such person is questioned, they say they will get the holes filled later. But over a period of time, these holes turn into potholes and these residents whine about the condition of roads in the interiors of the city. Contributed by Kuldip Bhatia, Shivani Bhakoo, Gurvinder Singh. Ludhiana: Sanatan Vidya Mandir Senior Secondary School celebrated ‘Children’s Day’ in the memory of Chacha Nehru. The whole campus was decorated with flowers. A cultural programme was organised by the students in which different items like play, skit, songs, dances and ‘qawali’ were presented. 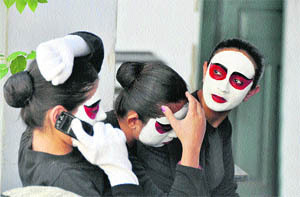 Students enacted a play on ‘Bhroon Hatya’. Tiny tots of presented a dance performance. The students of KG section dressed up as Khalsa, Pandit Nehru, Christian. Bal Bharati Public School organised a special assembly to celebrate the day. Various games and activities for pre-primary were conducted. The teachers presented dances and songs and enacted a story of "Jumbo the Baby Elephant", giving the moral not to be friendly with strangers and not get lured by the gifts they might offer. Children of junior wing came dressed up in different attires. A party was arranged for the students and they participated in various games. Spring Dale Public School celebrated Children’s Day. Children were dressed up as Pt Jawaharlal Nehru. Several card and rose making activities were organised in which all the children participated. The students were taken on an educational trip to the railway station to witness the exhibition displayed in Vivek Express. A morning assembly was conducted in which speech was delivered on the life history India’s first Prime Minister. A fancy dress competition was also organised. A house board decoration competition was also organised to mark the occasion. Speeches were delivered on the life and principles of Pt Jawaharlal Nehru. Various inter-house competitions like bulletin board decoration, rangoli making, flower arrangement, collage making, poster-making competitions were organised in which the students participated with full vigour. All the participants were given the certificates and prizes were given to the winners. The Rotary Club of Ludhiana Midtown took 150 underprivilged children of three NCLP schools to watch a movie. The children have been adopted by the club. Ludhiana: Penguin Castle Preschool organised a free medical check-up camp for its students to mark Children’s Day. Child specialist Dr Daljit Singh, principal and professor, pediatrics, DMC & Hospital, along with Dr Gagan Modgil, examined children. The doctors then apprised parents of a child’s growth and development. Immunisation update and dietary advice were provided to them. Kundan Vidya Mandir, Civil Lines, organised “Reena-Simmi Memorial Inter-School Declamation Contest” at the school auditorium. Sixteen teams comprising two participants each, one for English and one for Hindi, slugged it out. BCM Arya Model, Shastri Nagar, won the overall trophy. The host school did not participate in the contest. A “Kiddoz Carnival” was celebrated by the Apollo Hospital for the children of its staff. The programme was inaugurated by the vice-president (commercial) of the hospital. Many fun-filled cultural and sports activities were organised on the hospital premises. The activities included fancy dress competition, musical chair, lemon and spoon race and sack race. Over 70 children participated in the programme and were divided into three groups according to their age. Apart from cultural and sport events, a ramp walk of kids and their parents was also held. The school celebrated Children’s day with a cultural programme. The programme included speeches, skits and songs. Teachers presented cards to students. DAV Public School, BRS Nagar, celebrated the day by organising sketching, painting, card-making, creative writing competition in different languages. A cultural programme was presented by students to celebrate the Children’s Day at SKN Model School. They also performed a skit and recited poems on Pt Jawaharlal Nehru. An assembly was held at the school to pay tribute to Pandit Jawaharlal Nehru. Various games like puzzle, guess the item, ring game, hurdle race, musical chair were played by students. Students performed dances, medley, bhangra to mark the event. Teachers performed on the stage. Doraha: A house picnic was organised for tiny tots of Guru Nanak Model Senior Secondary School on the school campus. A magic show was organised. Refreshment was also given in the end. A quiz was organised by the staff of Sri Guru Harkrishan Public School for classes III to V on Monday. The quiz included EVS and math and included several rounds through power point presentations. A short play about mathematical numbers was also presented by the students. School principal Manjushaw Vinayak distributed the prizes. Children in Bal Bhawan celebrated Children’s Day. Although they smiled, when asked about the day but they missed their parents and family. There are about 62 children in Bal Bhawan, most of them have been left by their parents who were suffering from leprosy. Despite government campaigns about the eradication of leprosy, it is still prevalent in the poor sections of the society, denying children of normal childhood in the absence of parents. "No matter what, childhood is incomplete without parents," said N Sharma, working with an NGO. Rohit studying in class fourth at the school said he has been living there for two years and misses his parents. had only known Bal Bhawan as her home. Another child said he was left there because his parents had a disease and they became poor. Rakesh said he misses his parents when he sees other children coming for donation with their parents. On the call of state body, the district unit of Medical Laboratory Technicians Association staged a dharna in front of the Civil Surgeon’s office. All regular and contractual laboratory technicians, blood bank and emergency employees discontinued their services for 24 hours. Employees were demanding hike in grade pay, residential allowance and regularisation of the posts of contractual workers. Children’s Day celebrations were organised by the College of Nursing, paediatric OPD at CMCH. Chief guest Gurmeet Kaur, HOD, paediatric medicine, CMCH, highlighted the importance of mental and spiritual health along with the physical health as well as emphasised on prevention of diseases for childrens’ wellness. The exhibition aims at enhancing the knowledge regarding promotion and restoration of childrens’ health, so that quality life can be rendered to every child and ultimately leading to a healthy nation. RG Stone and Super Speciality Hospital organised a free medical camp on the Children’s Day. A free medical consultation on problems related to kidney stones, urinary incontinence and urinary infection were given by doctors. Around 150 children were examined. Hundreds of people participated in the awareness camp to fight diabetes. On the occasion World Diabetes Day, Ludhiana Mediciti, organised a “Diabetes Mela”. More than 350 patients were benefited from this mega event. The event highlighted the rising prevalence of diabetes in India and emphasised the importance of early diagnosis to reduce complications associated with the disease and thereby save lives. Free Insulin was also distributed to Type 1 diabetic children. Pearson Education, an education company, has taken a proactive approach in spreading the digital revolution in India and launched the comprehensive digital learning solution for Indian schools - Active Teach, in Ludhiana. The digital learning product was showcased during a workshop organised by Pearson Education titled “Design for change” conducted by Kiran Bir Sethi, founder-director of Riverside School. Top hockey outfits of the nation will be seen in action during the ninth All-India Gold Cup Hockey Tournament to be organised by Doraha Hawks Club at Mehta Gurukul Public Senior Secondary School from November 16 to 20. Defending champions Doraha Hawks Club, along with last year’s runners-up, SAI, Bhopa and those from SAI, Kurukshetra, Sports College, Lucknow, GF College, Shejapur (UP), MGPS Hockey Academy, SAI, Patiala, PNB Academy, Delhi, SAI Academy, Dhar, Sudhar XI, Shivalik Public School, Mohali, Grewal Academy, Kilaraipur, Sangrur Academy, SAI, Sonepat, Mata Sahib Kaur Academy, Jarkhar, and Sports School, Jalandhar, will be vying for top honours in the tournament to be held in U-21 category. Students of Guru Nanak Girls College, Model Town, Ludhiana, created history of sorts as they won the overall championship in the Panjab University Inter-College Athletics Meet held on the PU campus, Chandigarh, recently. It is after a gap of over 10 years that a girls college from the city bagged the overall trophy to stamp its authority in the university inter-college athletics event. Moreover, Naini Bala, an athlete from the college, was named the best athlete. She proved her mettle in 200m and 400m races. Other athletes from the local college, who secured positions to help their college win the overall trophy included Ramandeep Kaur, Prabhdeep Kaur, Rajni, Jaspreet Kaur, Amritdeep Kaur and Gaganpreet Kaur. Ramandep Kaur clinched gold medals in the 800m, 1,500m and hepthalon events in addition to a bronze medal in 400m hurdles. Prabhdeep Kaur finished as runner-up in the gruelling 10,000m half marathon, while Rajni won a silver medal in 400m hurdles and a bronze medal in 100m sprint. In javelin throw, two athletes from the college finished among position holders. Jaspreet Kaur and Amritdeep Kaur secured silver and bronze medals, respectively while Gaganpreet Kaur secured a silver medal in hammer throw discipline. Besides, the college relay quartet finished ahead of others to win top honours in 4 x100m and 4 x400m relay races. District Sports Officer of Ludhiana Surjit Singh Sandhu appreciated the girls for their outstanding performances and congratulated coach Sanjeev Sharma. The 13th Diwali Hockey Tournament being organised in memory of Dr Ishwar Singh, founder president of Guru Nanak National College, kicked off today at Guru Nanak Stadium. A total of seven teams, including Doraha Public School, Guru Nanak Model Senior Secondary School, Doraha, Nanakana Sahib Senior Secondary School Rampur, Nankana Sahib Senior Secondary School, Kila Raipur, Mehta Gurukul Senior Secondary School Doraha, Government Senior Secondary School, Jatana, and Malwa Senior Secondary School, Ludhiana, are participating in the tournament. Harpartap Singh Brar, general secretary of the college managing committee, inaugurated the tournament. The chief guest asked athletes to adopt a positive attitude towards life and be prepared for challenges with a stable mind, open heart and healthy physic. Principal Dr Narinder Singh Sidhu welcomed the chief guest and other dignitaries present on the occasion. The first match was played between Guru Nanak Model Senior Secondary School, Doraha, and Nanakana Sahib Senior Secondary School, Rampur, in which the former defeated the latter 6-1. The second match was played between Mehta Gurukul Senior Secondary School, Doraha, and Government Senior Secondary School, Jatana, in which the former defeated the latter 9-0. In a match played between Nankana Sahib Senior Secondary School, Kila Raipur, and Doraha Public School, Kila Raipur emerged winners.